The USB-1149.1/4E high-speed boundary-scan controller is a multifunction JTAG USB and serial in-system programming (ISP) unit designed for value while still providing high performance, versatility, and convenience. The compact form factor with four independently configurable Test Access Ports (TAPs) make the USB-1149.1/4E hardware ideal for integration in any environment— from the engineering desktop to the manufacturing line. The USB-1149.1/4E controller works with the complete ScanExpress™ family of boundary-scan and JTAG-based test tools, enabling comprehensive multi-TAP boundary-scan test and ISP in lieu of or as a complement to traditional in-circuit test systems, reducing or eliminating the need for expensive bed-of-nails test fixtures. High-performance multi-TAP JTAG USB controller with integrated I2C and SPI interfaces. Four TAP connections for designs with multiple scan chains. User programmable JTAG TCK rate up to 100 MHz, SPI SCK rate up to 50 MHz, and I2C SCL rate up to 5 MHz. Assignable pins including three general purpose I/O signals per TAP. Variable output voltage and configurable input voltage threshold. Automatic signal delay compensation for long cable lengths. High-speed bus-powered USB 2.0 interface ideal for the bench and desktop; no external power supply required. Scan Function Library software supports Microsoft Windows 7, Windows 8/8.1 and Windows 10 operating systems (32-bit and 64-bit). The Corelis USB-1149.1/4E JTAG controller is fully compliant with the IEEE Standard 1149.1 for test access. The USB-1149.1/4E connects effortlessly between the host PC high-speed USB port and up to four TAP connectors on any JTAG-based target system and is specifically designed to be both portable and durable. 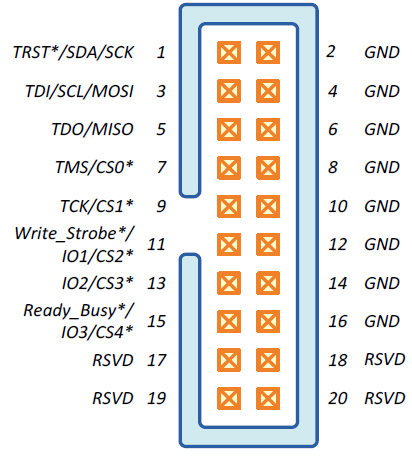 Integrated SPI and I2C interfaces on each TAP connector make the USB-1149.1/4E ideal for multi-TAP JTAG and in-system serial bus programming integration. For further flexibility, all odd TAP connector pins may be arbitrarily assigned in software to accommodate a variety of UUT pin-outs. For applications that require a low level interface or integration with third party software, Corelis offers a Scan Function Library (SFL). The SFL is provided as a 32-bit DLL for Microsoft Windows and provides all functions necessary to operate the JTAG port and send or receive JTAG instructions and data to the target system. Users can incorporate the drivers in their own application software or integrate the SFL with third party systems such as National Instruments LabVIEW, National Instruments TestStand, and Agilent VEE. For complete specifications, please refer to the USB-1149.1/4E User’s Manual. 2-pin (2×10) header (0.050 inches × 0.100 inches). Programmable from 1.25 V to 3.30 V in 0.05 V steps. Programmable from 0.50 V to 3.30 V in 0.05 V steps. Leverage boundary-scan to test, debug, and verify hardware through all product life cycle phases—from development through production and into the field. Control a microprocessor through the JTAG debug port to run functional tests, without requiring boot code. Read, erase, program, and verify Flash Memories, serial PROMs, CPLDs, FPGAs, and other programmable devices directly within a circuit or system design. Save time at test stations with high performance JTAG features—up to 100 MHz for lightning fast test and in-system-programming speeds. Increase system capability for in-system-programming; the advanced architecture provides persistent scan vector output and extraction, ensuring that throughput remains high at all times. Reduce costs associated with fixtures; the portable multi-TAP controller directly connects to up to four TAPs of a Unit Under Test (UUT) and fits easily anywhere. Compatible with the complete ScanExpress™ family of boundary-scan, ISP, and JTAG embedded test software. Corelis offers a complete family of boundary-scan test, JTAG embedded test, and in-systemprogramming tools—all fully compatible and with the USB-1149.1/4E advanced features.